Everyone dreams of traveling as much as they possibly can, but with the high costs associated with flights, lodging, and entertainment, it can often be financially difficult to go on a vacation without breaking the bank. However, there are a few guidelines you can follow to travel on a budget and not skimp on all the extras. Here are a few ways to travel without blowing all your money. No matter which way you choose to travel, a major cost in your travel will undoubtedly be transportation. If you are traveling domestically, you can save an astronomical amount of money by traveling via bus. 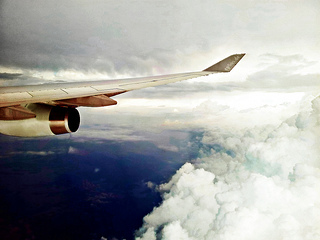 If you simply must travel by plane, be sure you check every avenue possible to book the tickets. That includes online websites, travel agents, and any other resource you can exhaust. You may not be aware of it, but there are options other than hotels for you to get a good night's rest. Motels are a cheaper equivalent, as are hostels, although they can be tough to find domestically. Other options would include renting a camper van to sleep in, if you're into the outdoorsman scene. However, the most frugal way to sleep would be to get a vacation rental, which combines affordability with the touch of a private owner. If you simply must stay in a hotel, groupon will help find luxury at an affordable price. One often overlooked expense is food. While it may seem that you have to eat out for every meal, that couldn't be further from the truth. If you can find a local farmer's market or supermarket, you can put together affordable meals and snacks along the way. Unless there's a local delicacy you simply must try, or you forget to pack some food for a day trip, doing your own cooking can save you a considerable amount of money. Whether or not you've tried an all-inclusive resort, you may want to consider it. These resorts give accommodation, all-you-can-eat food and drink, and usually some sort of entertainment and a flat rate. While the adventurous traveler may shun the idea, exploring outside the resort is easier than you may think. You can go hiking, fishing, boating, scuba diving, and do many other activities outside of the resort at only a little extra cost. If you like seeing as much as you can while on your travels, than tours seem to be the way to go. However, they are usually very expensive. Before you embark on your journey, write down all the different places you wish to see on your trip. Then, figure out how to visit them all without going on an actual guided tour. You'll be impressed by how much money you'll save as well as the freedom it gives you to explore landmarks for as long as you'd like. Traveling doesn't have to drain your entire bank account. In fact, if you plan ahead, you can save yourself enough money to do little extras along the way. No matter what you decide to do, traveling on a budget is well within your reach. The only problem you'll have is deciding what to do with the extra cash. Very nice post. useful post for those who wanna travel in required budget. Thanks for sharing your nice concept.